Bats in Texas, Bats in War and Peace. Bats are coming back to Texas for the summer, which isn�t news because bats have spent their summers in Texas for the past 10,000 years. Only their failure to return would rate a banner headline. As it is and has been, about 100 million bats, mostly Mexican free tail bats, make their summer homes in Texas. The bats love Texas for the same reason a lot of people do: geography and climate. Bats love caves and the state has some 3,000 caves and sinkholes though most of the bat colonies are concentrated in about two dozen of those caves. Bracken Cave near Frederiksburg has a thriving metropolis of 20 million bats, the largest known bat colony in the world. Those 20 million bats can eat 200 tons of insects in a single night, including mosquitoes and agricultural pests that plague cotton and corn crops. While taking sensible precautions in regards to bats as carriers of rabies, we have asked our bats to wipe out other diseases. We have even enlisted bats in the war effort. Results of these experiments have been mixed. Early in the 20th Century, Dr. Charles Campbell, a physician, built a �municipal bat roost� as part of an effort to fight malaria, which killed millions of people worldwide each year. Dr. Campbell saw the ravages of the disease in some his own patients and wondered if bats could be colonized like bees in bat towers to prosper and multiply and end the ravages of malaria once and for all. Bats turned out to be pickier about where they lived than Dr. Campbell first imagined; they stayed away from his first bat towers in droves. Giving the matter closer observation he decided to try again, this time closer to water. A bat tower he built in 1911 near swampy Mitchell�s Lake a few miles south of San Antonio proved the first glimmer of hope. Mitchell's Lake was notorious for its hordes of mosquitoes and no wonder: this was where San Antonio�s sewage flowed, creating perfect breeding grounds for mosquitoes. Tenant farmers in the area were so bedeviled by the swarms of mosquitoes that they often were forced to leave their fields untended and the livestock in sorry condition. Dr. Campbell later wrote that of 87 people he examined near Mitchell�s Lake in 1911, 78 suffered from malaria. The bat tower at Mitchell�s Lake brought a few bats the first year, more bats the next year and a veritable horde the following year. Where it once took him five minutes to watch the bats spiral from the tower each summer evening, it soon took two hours. People came and watched the spectacle, much as the bat roost under the Congress Avenue Bridge today attracts visitors every evening when the bats are in town. Within four years, farmers near Mitchell�s Lake reported that they could now work their fields without being attacked by dense clouds of blood-sucking mosquitoes. Malaria all but disappeared from the area. Dr. Campbell�s efforts brought him a Nobel Peace Prize nomination in 1919 but the bat towers soon faded from public consciousness and the landscape. There may be a handful of the original towers left here and there but most have given way to the ravages of time and progress. 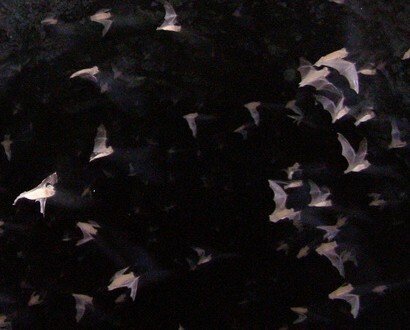 In a 1989 article for the Bat Conservation International magazine, editor Mari Murphy noted that the disappearance of malaria around the time of Dr. Mitchell�s bat towers was well documented but the extent to which the roosts could be credited was not scientifically studied and thus open to question. �The success of Dr.. Campbell�s experiments can no longer be tested, since most of his bat roosts and the original mosquito breeding conditions are now gone,� she wrote. While Dr. Campbell�s bat towers are viewed today as an idea that just might have worked � we can�t say for sure � an idea hatched in top secrecy during World War II leaves no room for such ambiguity. Not long after the Japanese bombing of Pearl Harbor, the U.S. Government put an oddball cast of characters to work researching how bats might be turned into small incendiary bombs and dropped on Japan. Really. The research was carried out in unlikely places like Bandera, Carlsbad, New Mexico, and California. It cost about $2 million and involved a lot of risky behavior in caves, recruiting these unlikely flying mammals into the war effort. The plan concocted by the researchers involved refrigerating the bats into hibernation then equipping them with tiny parcels of napalm and little bitty parachutes and dropping them on Japanese cities, which would burn to the ground when the bats flew into the nearest buildings. That was the plan. Details of the unlikely project, from batty conception to fiery conclusion, is chronicled by the youngest member of the team, Jack Couffer, in his book �Bat Bomb: World War II�s Other Secret Weapon� published by the University of Texas Press in 1992. As it turned out, the bats couldn�t be whisked into hibernation and snapped out of it on any kind of convenient or reliable schedule. The parachutes were too small. The napalm bombs were too big. When the bat bombs were tossed from airplanes some of the bats hit the ground without ever waking up while others ended up with broken wings. A few lucky ones survived the free fall and flew off, just as expected, into the nearest buildings, which turned out to be the airport hangars at a brand new military airfield. The hangars burned to the ground, a general�s automobile was incinerated, and that was that. The military dropped the bat bomb project but proceeded with another plan that showed promise, something called an atomic bomb.